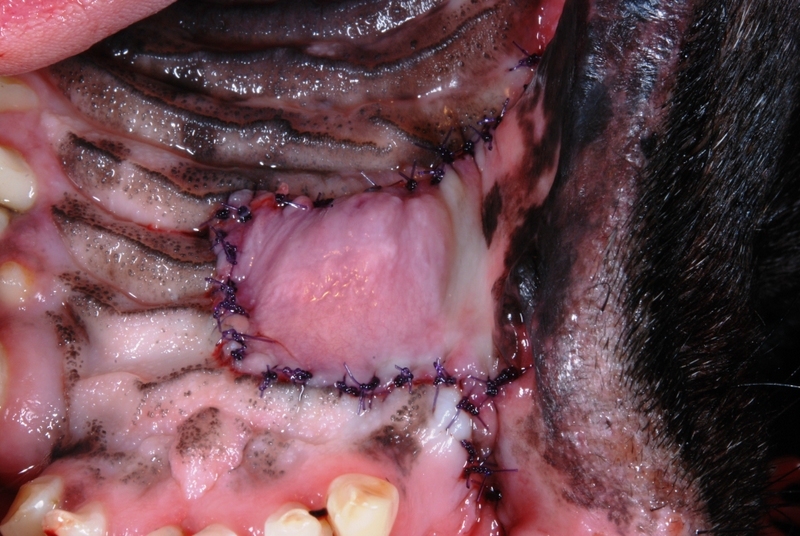 Oral surgery is frequently required in animals with oral tumors, extractions, oro-nasal fistula or palatal defect repair, periodontal disease and fracture repair. Veterinary Dental Center of Tulsa has the ability to treat most conditions requiring surgery. If a tooth cannot be saved with root canal therapy, extraction may be the only option. The tooth roots on a dog or cat are very long and may require surgery to extract them. A gum flap may be create and the bone surrounding the roots may be removed to completely extract the tooth. Sutures are placed to closed the extraction site. Oral tumors are frequently found in dogs and cats. A biopsy may be required to determine if it is benign or malignant. Many tumors can be easily treated with oral surgery. Additional tests may be required to determine if the tumor has spread to other areas in the body. Trauma is a major cause of jaw fractures, but periodontal disease can also cause the bone to fracture. Bone loss can occur from the infection around the teeth leading to weakened bone. Different treatment options may be recommended based on the type of fracture. Congenital and acquired defects may occur in pets. Many palatal defects allow food and debris to enter the nasal cavity. This may lead to chronic nasal infections or pneumonia.